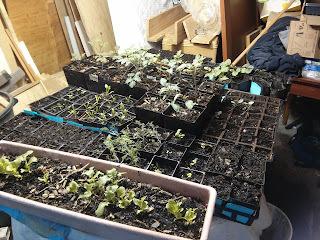 It must be time for another blog post since I'm starting to get questions on what is going on with the garden! 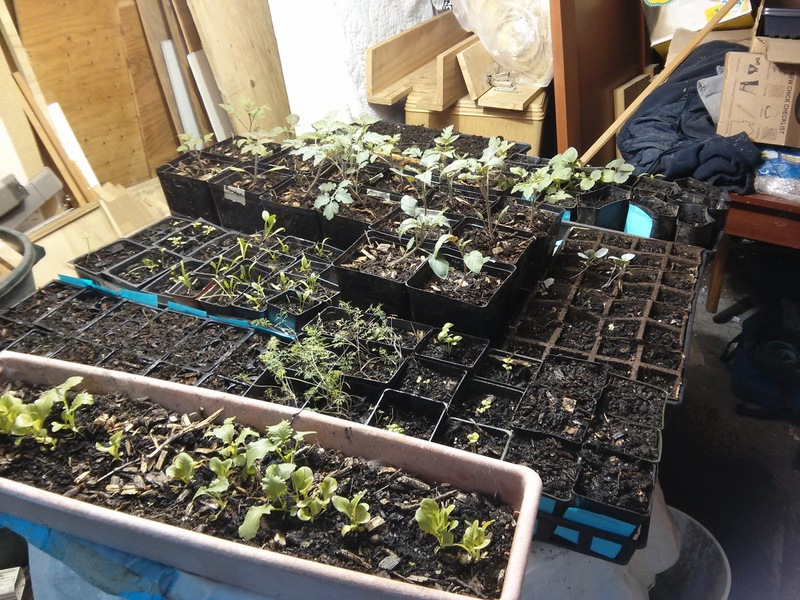 I have continued to plant starts in trays for a continuous Spring and Summer harvest. Most recently I transferred Roma, Cherry, and Brandwine Pink tomatoes from small starting pots to intermediate pots. Mom and I also used some of the temporary free space between fruit trees in the orchard to transplant leeks and to plant white onion starts. That space between saplings is vital to us this year as I'm at least doubling my crop this year compared to last and we have much work left to do in spreading more wood chips. By the time the fruit trees have branched out and shaded most of that side of the yard we hope to have felled the other ginormous pine tree on the other side and have spread wood chips over there too. 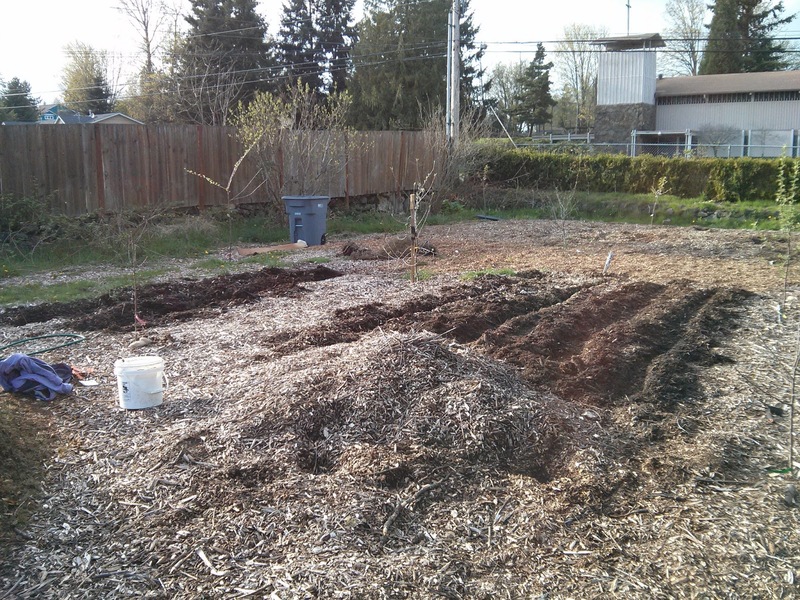 Right now we have two Motmorency pie cherry trees over there but I'm hesitant to plant anything other than shade loving crops because of that big pine. The mound of chips is just waiting to be spread out. Do you see my beautiful pumpkin and squash sprouts top right-ish?! So happy! What's a garden shot without lettuce? Tonight we set up one of the fluorescent lights over a second table in the "wood shed" for added seedling space. 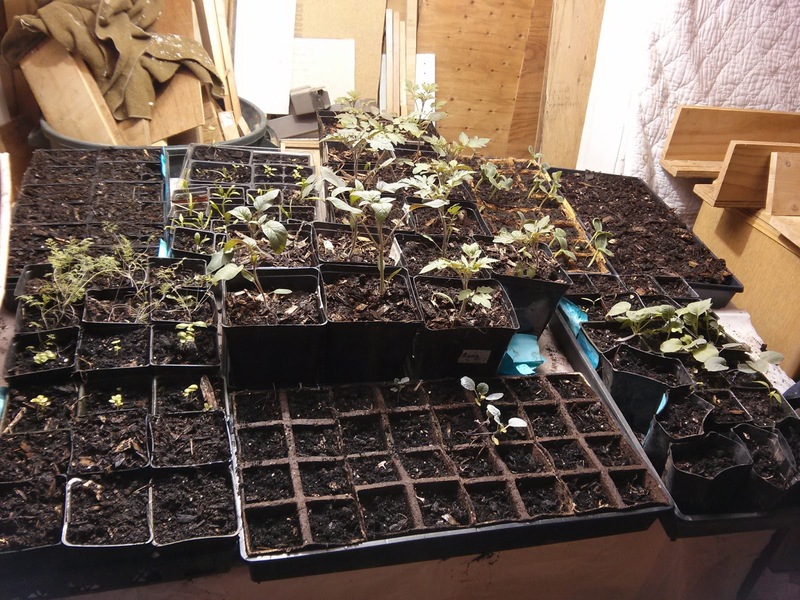 That was the last step in moving the seedlings out of the attic and into an area with less foot traffic and more tolerance for warm, humid environments. We also adopted some adorable Easter present chicks from a grandma at our church. For three years she has asked if we would rehome a batch of chicks before deciding to gift them to her grandchildren. We are happy to provide for an educational farm animal experience and to rehome chicks for free! I call that a win win. Last but not least, keep your eyes and ears open for news and pictures regarding Chestunut's kids. She was locked away in the birthing stall all day since she was showing all the signs of early labor but she just never transitioned into active labor. Unfortunately, I will be at work tomorrow so that will leave the nurse with Shoshana, my mom with Abi as well as keeping an eye on our less-experienced birther. If anything happens I just hope she remembers to take pictures! Rosemary in foreground getting loves, Chestnut in back.